Jack Smith, K8ZOA posted an interesting paper on "Measurement approaches of Crystal Motional Parameters" and designed a test fixture (based on the "classic" IEC 444 pub. fixture) to aid such measurements. The fixture is rather simple - it is comprised of two impedance matching attenuator pads, presenting the crystal resonator with a low, accurate impedance (12.5 Ohms, the center of the 5-20 ohm range of crystal's series resistance) during transmission measurements and transforming it from and to the 50 ohms impedance of the source and detector. These attenuators act as sort of a "buffer" - because of the transformation, the crystal "sees" only the accurate 12.5 Ohm input and output impedance regardless of the source's and detector's return loss. Each attenuator is in Pi-pad configuration with attenuation of approx. ~15 dB (due to standard resistor values, the actual calculated attenuation for each pad is 14.81 dB). Input shunt is 158.0 Ohms, series resistor is 66.50 Ohms and Output shunt is 14.30 Ohm (ideal calculated value is 14.20) - all in 1206 packages 1% tolerance. It occurred to me that Ivan Makarov's N2PK VNA Reflection Bridge PCB can be modified very easily to accommodate both pads and I can use the board to build the entire test fixture. The modification is very simple! I used a Dremel Tool to drill (Carbide PCB drill bit #71, 0.0260") 3 holes (0.1" spacing) for the crystal socket / header and a small end mill bit to make to cut two trace cuts. The socket is a gold-plated machined type - it can be cut from an IC machined socket. The HC-49 crystal package fits perfectly in the socket. An adapter can be made if the fixture is to be used with other components with larger diameter leads. 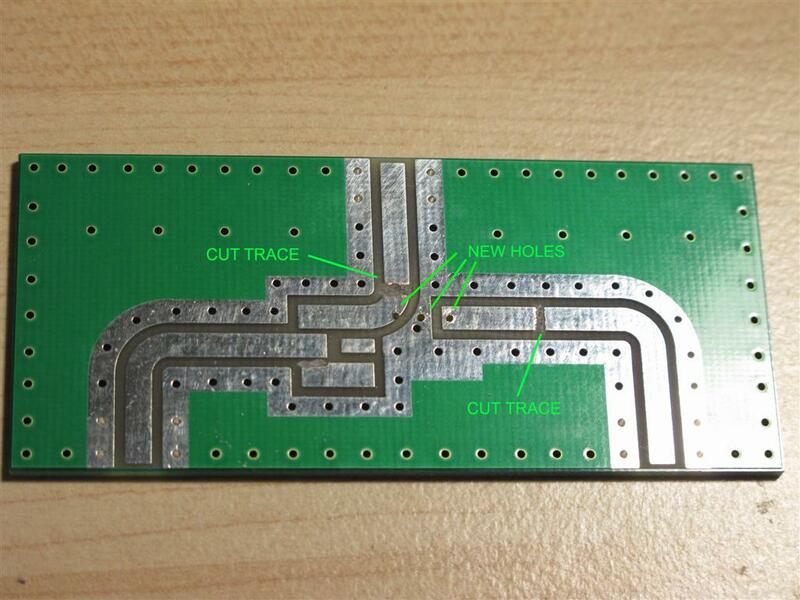 The socket is installed on the reverse (solid ground plane) side of the board. The middle pin is soldered to the ground plane on the component side. Copper is removed around the two side holes (on the socket side) so it will clear the bottom part of the socket pins. The ground plane should clear each socket pin by at least 1 mm around (the diameter of the no-copper area around each hole is about 0.1"). Again, a round end-mill bit or a big round engraving diamond file bit on the Dremel Tool will do the job. This picture shows the configuration of the resistors in each Pi-pad. The ideal value for the output shunt is 14.2 ohms, so I installed 2.2k (1%) resistors in parallel with each 14.3 resistor to bring the resistance down. I used my LCR meter to select all attenuator resistors in order to have values as close as possible to the ideal calculated values. RF screen (cut from tin-plated brass sheet) is installed across the board, on the component side to shield the output from the input. The unnecessary PCB pads are flooded with solder and connected to the common ground plane. Two edge mount SMA (f) are installed 2" apart. The 2" spacing matches my N2PK VNA port spacing so I can install the fixture directly on the VNA ports without the use of any cables. Two copper-beryllium contact clips - one on each side of the socket are soldered to the ground plane. These spring clips connect the resonator's can to ground when the crystal is inserted and provide additional mechanical support for the crystal package. The picture also shows the THRU calibration jumper and 50 ohm load test jumper.